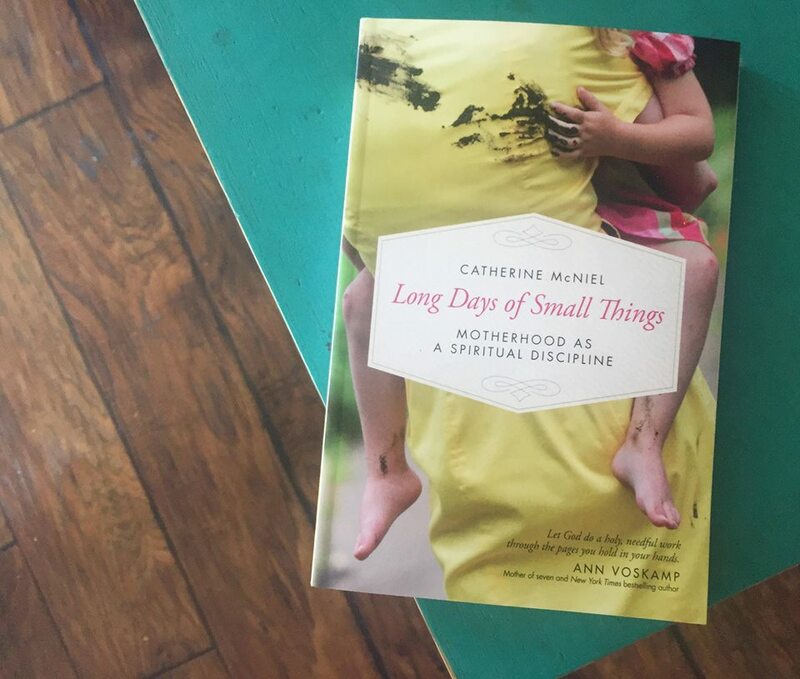 The Redbud Post interviewed Catherine McNiel about her new book: Long Days of Small Things: Motherhood as a Spiritual Discipline. A few years ago, I was a work-from-home mom with a baby, a toddler, and a preschooler. These precious, demanding children took me all the way to the end of my rope…and left me there indefinitely! My life changed in every way, yet I heard only the same spiritual prescriptions I’d always heard: spend quiet time each day with God. Find 30-60 minutes each day to be in silence and solitude before the Lord. As I considered the classic spiritual practices (which I love! )—prayer, worship, fasting, meditation, service, solitude, etc.—it became abundantly clear that the realities of motherhood meant I was likely to fail. Or opt out entirely. But my spirit didn’t allow me to do that. I heard a lament rising in the hearts of the women around me—I have nothing left, nothing left to care for myself or give to God. But as I looked at the actual seasons and tasks of motherhood, I was convinced that there was no better “boot camp” for my soul. Each day, we mothers create, we nurture. Each day we are pushed to the end of ourselves and must surrender, sacrifice, and persevere. Each day we serve, pouring ourselves out. We empty ourselves for those in our care—and isn’t this emptiness the very reliance on God that the spiritual disciplines are designed to produce? I’m convinced that motherhood is doing an eternal work in my soul, even if I’m too exhausted and overwhelmed to notice just now. Have you had moments when you felt you were totally failing or falling short as a mother? How did you cope? All the time! I begin Long Days of Small Things with a confession: I’m not “winning motherhood.” Chaos is hard for me, and motherhood is full of chaos! Noise, mess, and unexpected changes to routines and plans. Since I was taught to see spirituality as something best suited to silence and peace, it seemed I must be failing—not only as a mother but also as a person of faith. But the very physical experiences of motherhood defied my ideas of peaceful spirituality. What could possibly be more earthy and bodily than pregnancy, growing another person in your body? What about the blood and waters of birth? The dripping breasts of lactation? The constant physical needs of children and toddlers—all of which speak deeply of love and nurture and service. All of which require surrender, sacrifice, perseverance. I began to realize that God’s work in the world has always been messy, earthy, and bodily. Genesis 2 speaks of him as a gardener, getting his hands in the dust and dirt, forming the creatures by hand and breathing his own breath into them. Then he plants the growing things in the soil—again, personally, by hand. Later in the Bible, God describes himself as giving birth to his people, of teaching them how to walk; of sheltering them as a mother bird would shelter her chicks. Then the incarnation! God communicated most powerfully to humanity by becoming a baby in his mother’s womb! Mary went through pregnancy, labor, delivery; her body was broken and torn to create new life—and this is how God entered the world. He lived life just as we all do—learning to eat with his fingers, chasing after siblings, growing up. Then, to redeem us, he didn’t fight to victory like a mythological super hero—he faced brokenness, blood, and death. God, in his most dramatic acts, entered the world the same way we all do—birth. He left the same way we all do—death. And in his resurrection, he promised a new creation, a new body, a new earth. I began to realize that the messy days of motherhood—whether dripping breasts for babies or packing mud pies for children—these are the very things that God made and did. This is where he has always been. I was shopping with my three kids. Can you imagine the scene? Lugging my infant in one of those terribly unwieldy baby carriers. Holding my toddler by the hand, while my preschooler zoomed around the store. The diaper bag was falling off my shoulders, and I clenched the grocery bags with the same hand that grasped my toddler. And then…the door. I couldn’t figure out how to get us all through. The baby was wailing for milk and a nap, the toddler and preschooler needed lunch (and a nap). I just wanted to get us out the door. No one held it open for me, but plenty of people watched me make a fool of myself trying to wiggle us all through without banging any heads or pinching any fingers. It felt like a hero-feat, an epic win. When I finally got everyone home, fed, and sleeping, I sat down to read an article I’d been saving, a short biography of a favorite Christian teacher. The biographer described this hero of the faith as so spiritual; he radiated peace just by walking through the door. The contrast between this teacher and myself was so stark; I realized he and I were simply on two separate paths. I was seeking God through the chaotic but life-giving seasons and tasks of motherhood, and this was going to look entirely different from the classic spiritual practices. “Results may vary” as they say. I wish I had a penny for every time someone has recommended to me a book on spirituality for moms. Almost all of them have this in common: after admitting that moms are exhausted, stretched too thin, without any margin or time or energy, they look for a few extra minutes here or there which might be harvested for God, or offer a Bible study or prayer list that might fit in the tiny slots. Get up at 4:30 a.m.! Read only two minutes of the Bible each day! I’m all for doing these things when it works, but I’m convinced that we don’t need to exit motherhood to have a spiritual life. Our children are what we create, and this is where Creator God meets us. I’m certain of it. Without adding more “shoulds” or “to-dos” to our days, we can open our eyes to a unique spiritual journey, made just for us—and find him here. We’re already doing it—all that waits is for us to breathe deeply and recognize it. As exhausted, full-time moms, how do we find strength in spiritual disciplines? My children often keep me from traditional spiritual disciplines. When you haven’t slept for more than two hours at a time for years, you tend to fall asleep (or just start babbling incoherently!) during prayer. Fasting is off the table if you’re pregnant or breastfeeding. I spent most worship services in the nursery or bouncing in the hallway—same for my Bible study. But in Long Days of Small Things, I outline three “practices” at the end of each chapter. These are things we moms are already doing—walking, breathing, eating, cooking, driving, laundry, going to work—and consider how these everyday tasks can be done as spiritual practices. If Jesus taught his farming and fishing neighbors about the Kingdom of God using stories of sheep and fish and fields, I have a feeling he would teach me through peanut butter sandwiches and messy school backpacks. I’m convinced we can find him right here, right where he made us. As a grandma, I look back on the days my 3 kids were at the ages of yours, and I, too was a full time, stay -at-home mom. It was really exhausting, but He met me everyday. And, yes, thank you for pointing out that the self-sacrifice was just the spiritual discipline I needed. My faith is strong today, thanks to the prayers offered up multiple times a day – prayers He so lovingly answered-and the way He trained ME up as I trained them. Thank you Lynn! I’m grateful to hear your story. My daughter and I were just talking about this! So, here’s a question-what can I, as an ‘older’ woman do to help? I can help physically no problem but spiritually. I grew up with useless platitudes and little support. I do my best to steer clear of anything cliche but long to spiritually support younger women in the trenches. Susan, I think that often time (at least in my experience) the physical help DOES impact me spiritually. I can still pinpoint the exact moments and words when “older” women asked me “Are you sleeping? Are you eating? Can I come over and help you?” The willingness to step into someone’s life and be present is always a game-changer. That’s what Jesus did, stepping into our world and being present in the middle of it all. Thank you! Absolutely. I now have four daughters/in law and I’m buying this book for all of them. Cool perspective that takes so much weight of guilt off .. I wish I’d had it when I was a young mum. Thank you so much Bev! I pray that it does.